A popular, limited edition collection by Methven, the designer and manufacturer of premium showers and tapware, has been expanded. The award-winning Aio handset, featuring patented Aurajet® technology, has now been launched in matte black and added to the Methven Black collection. 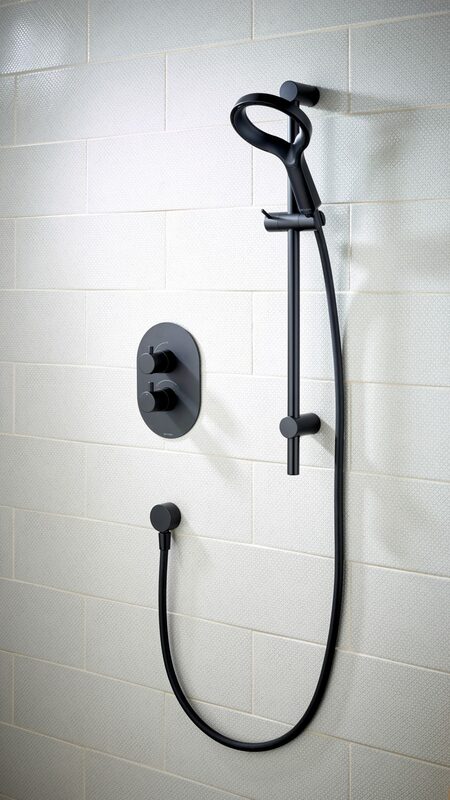 Paired with the Krome 120mm Rail Shower, with adjustable mounting brackets for easy retrofit installation, the Aio Black Rail Shower introduces the unparalleled Aurajet showering experience with the stunning new matte black aesthetic. Aurajet technology takes the science of showering to new levels, using invisible hidden nozzles to generate single jets of water that hit precisely-engineered surfaces to produce a wide, even shower spray with no gaps and enhanced droplet density. The Methven Black collection, launched in late 2017 in response to consumer demand for black products, also includes a Krome 200mm Wall Shower on an arm; the Krome 120mm Three Function Rail Shower featuring Airstream™ technology; Kaha Concealed Thermostatic Mixer Valves with either one, two or three outlets; the Breeze Mono Basin Mixer; press top waste, bath fill and overflow and bottle trap.